Despite closing its doors nearly thirty years ago, interest in Salsoul Records has never been higher. A new generation of music lovers are rediscovering what was undoubtably disco’s premier label. So too, are a new generations of DJs. Realizing that Salsoul Records’ illustrious back-catalogue is a goldmine for killer tracks and elusive breaks aplenty, any self-respecting DJ has to have a healthy supply of Salsoul albums in their collection. These are both a DJ and producer’s secret weapon. For a DJ whose losing the dance-floor, drop a Salsoul classic and normality is restored. Similarly, for a producer suffering from writer’s block and looking for “inspiration,”a killer break from Salsoul’s back-catalogue could transform a track. That’s no exaggeration. In the early days of house music, certain producers created many a successful track around a Salsoul break. Who can forget Black Box’s Ride On Time which sampled Loleatta Holloway’s Love Sensation. That’s just one of a plentiful supply of breaks awaiting discovery for the determined crate-digger. One man whose a crate-digger, DJ and producer is DJ Muro. Recently, he combined his DJ-ing and crate-digging skills on his new mix CD, Diggin’ Salsoul Breaks. Released on Octave Japan, DJ Muro incorporates twenty-two Salsoul breaks in just under eighty minutes. Best described as a compelling and education musical journey through Salsoul Records’ back-catalogue. 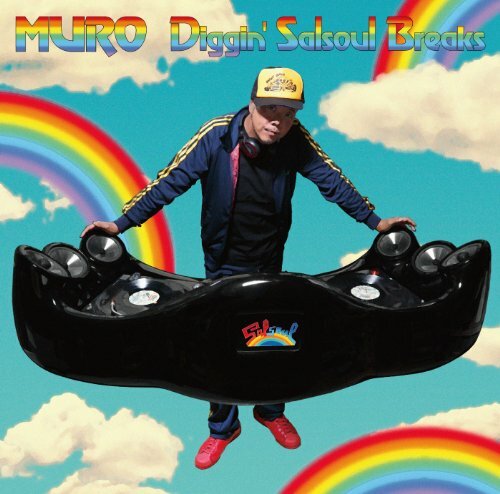 Diggin’ Salsoul Breaks is just the latest mix CD DJ Muro has released in his twenty-five year career. Muro’s name is synonymous with his King Of Diggin’ series. It’s through that series that DJ Muro’s name became so widely recognized outside his native Japan. Whether it’s Europe, North America or Africa, DJ Muro is widely recognised. His reputation extends beyond DJ-ing. He’s established a reputation as a prolific producer. Then there’s DJ Muro’s crate-digging exploits. Over the past three decades, he’s gained the reputation as a crate-digger’s crate-digger. There’s nowhere DJ Muro won’t travel in pursuit of the perfect break. Proof on this is Diggin’ Salsoul Breaks, which I’ll pick the highlights of. Unlike many Salsoul compilations or mixes I’ve heard, DJ Muro takes a different approach on Diggin’ Salsoul Breaks. Rather than fill Diggin’ Salsoul Breaks full of Salsoul classics, he’s dug deeper in search of the perfect break. Spoiled for choice, what he’s come up with, is a compelling combination of tracks from familiar faces and some leftfield choices. Among the familiar faces, are contributions from Loleatta Holloway, The Salsoul Orchestra, Double Exposure, First Choice, Inner Life and Instant Funk. These tracks don’t include the “greatest hits.” Rather than Dreamin’ or Love Sensation from Loleatta Holloway, All About The Paper Is Chosen. As for First Choice, there’s neither Dr. Love nor Let No Man Put Asunder. Instead, Love Thang is chosen. The same goes for The Salsoul Orchestra, Double Exposure, Instant Funk and Inner Life. Rather than this being a case of a contrary DJ, it’s a case of searching for what DJ Muro sees as the perfect break. To do that, he has to eschew the familiar and dig deep, deeper than many DJs would dare to dig. In his pursuit of the perfect break, DJ Muro has dispensed with the familiar. Instead, there’s contributions from Joe Bataan, Kongas, Tierra, Sound On Sound, Tierra and Dr. Perri Johnson. There’s also hidden gems from Candido and Skyy. Diggin’ Salsoul Breaks you’ll realize, is no mix of Salsoul Records’ greatest hits. Not at all. It’s a educational musical adventure where the far corners of Salsoul’s vaults have been searched for that elusive, perfect break. However, it may not be for everyone. After all, DJ Muro has eschewed the familiar. For me, that’s no bad thing. The most important thing is, the quality of music on Diggin’ Salsoul Breaks. That’s what I’ll tell you about. The first three tracks on Diggin’ Salsoul Breaks demonstrate with varying degrees of success how post-disco, Salsoul changed. It was a case of evolving to survive. Instant Funk’s The Funk Is On was the title-track to their third album for Salsoul. Given this was the post-disco age, with boogie now flavor of the month, this is quite unlike the music that made Salsoul disco’s premier label. Fusing funk and boogie, it demonstrates how both Instant Funk and Salsoul were evolving to survive. So too, does Dr. Perri Johnson’s Psyched Up, which was released in 1982. Although this is an “instrumental version bursts of cartoon vocals can be heard. They’re combined with flourishes of harpsichord and synths, and result in a quite un-Salsoul track. Indeed, it’s not worthy of baring the Salsoul label. The proto rap of Sound On Sound Productions The Incredible Hump is a slight improvement. It further demonstration of Salsoul’s evolution of a label and how they still were striving to release innovative music. An earlier track was Gaz’s Sing SIng. Originally recorded by German label Lollipop, producer Jurgen Korduletsch wanted Salsoul to distribute the track. His decision to do so was rewarded. It’s since become a minor Salsoul classic. Released in 1978, it’s a joyous track, with a real feel-good sound. Crucial to the track was another of Jurgen’s discoveries Claudia Barry. She was responsible for the vocal. Pounding drums and guitars, are joined by the bass, percussion and strings before Claudia Barry’s vocal enters. Her vocal is answered by a male vocalist, while the rhythm section is augmented by rasping horns, keyboards and percussion. Soon, the best of European and US disco unites as one, resulting in a minor Salsoul classic. Love Thang featured on First Choice’s second album for Norman Harris’ Gold Mind Records, Hold Your Horses. It only reached number 135 and number fifty-eight in the US R&B Charts. Penned by Melvin and Mervin Steals with McKinley Jackson, who arranged and produced the track. From the opening bars, you realize that something special is about to unfold. With a pounding, punchy rhythm section, shimmering strings and percussion combining First Choice add sweet and sassy vocals. With handclaps accompanying them, the track swings along, with Rochelle strutting her way through the track. Horns rasp, strings sweep and swirl, while the rhythm section produce the track’s funky heartbeat. Together they play their part what’s a musical Magnus Opus. Inner Life II wasn’t just their final album for Salsoul, but the final album of their short career. It neither matched the quality nor success of Inner Life I. One of the two singles which charted was I Like It Like That, ia track that you can almost date to 1982. It’s the combination of instruments that are deployed to accompany Jocelyn’s vocal. The synths have an unmistakable early eighties sound, as do the drums. They’re joined by Jocelyn’s joyous vamp, while the rhythm section and eighties keyboards drive the track along. Having said that, the track still has an infectiously catchy eighties sound, made all the better by Jocelyn Brown at the height of her powers. Of all the disco orchestras, The Salsoul Orchestra were the best. That’s indisputable. This was obvious from their 1975 million-selling, debut album The Salsoul Orchestra, which features Chicago Bus Stop (Ooh I Love It). Here, The Sweethearts of Sigma add breathy, sassy vocals, while The Baker, Harris, Young rhythm section lock into a funky groove. Meanwhile keyboards, guitars and percussion are joined by sassy, sensual harmonies. A sultry alto-saxophone enters, strings, dance and harmonies drift in and out. Dramatic stabs of growling horns accompany the saxophone. Baker, Harris, Young never miss a beat. They’re responsible for the mesmeric, hypnotic backdrop, as flourishes of woodwind and percussion add a Latin flavor. Here, funk, Philly Soul, disco and Latin are fused with flair and a flourish and aplomb to irresistible effect. Everyman which was a track from Double Exposure’s debut album Ten Per Cent, is an example of what made Salsoul disco’s leading label. Released in August 1976, it reached number 129 in the US Billboard 200 and number forty in the US R&B Charts in August 1976. When Everyman was released in October 1976, it reached number eighty-four in the US R&B Charts and number eight in the US Disco Charts. It deserved to fair much better. Bursting joyously into life, a flourish of piano, the funky Baker, Harris, Young rhythm section, blazing horns, dancing disco strings and Vince Montana’s vibes give way to Jimmy’s vocal. Mixing power, passion and joy, he brings out the meaning in the lyrics. Harmonies sweep in, with the Sweethearts of Sigma augmenting Double Exposure. As Double Exposure and The Salsoul Orchestra kicked loose, it’s a joy to behold. Everyone plays their part in this anthemic, inspirational and uplifting song’s success. Another example of the music that made Salsoul great is Loleatta Holloway’s All About The Paper. This was a track from her 1979 album Loleatta Holloway, which failed to chart. Despite that, it’s become a Salsoul classic and a favorite of DJs, remixers and compilers. Chiming guitars, punchy blazing horns and a pounding rhythm section combine to create the perfect backdrop for Loleatta’s vocal. Briefly, you can hear similarities with Chic’s Good Times. When Loleatta’s vocal enters, it’s a sassy, feisty, strutting vamp. She makes the song her own, demonstrating just why she was the Queen of Disco. Strings dance with delight, while the Sweethearts of Sigma add tender harmonies and bursts of horns punctuate the arrangement. What really makes the song is Loleatta’s vocal, one that feisty, fiery and sassy. Combined with a what’s simply a timeless, dance-floor friendly arrangement and the result is vintage Loleatta. Flakes’ Sugar Frosted Lover was a track from their 1981 eponymous Flakes. It’s a track that combines Salsoul old and new. Featuring a deeply soulful vocal that’s reminiscent of Philly Soul, the funky, arrangement relies upon synths. in many ways, it’s a track that straddles two decades. It has a post-disco sound, but is definitely soulful. Getaway is another example of The Salsoul Orchestra in their prime. Taken from their 1977 album Magic Journey. It reached number sixty-one the US Billboard 200 and number fifty-one in the US R&B Charts. When Getaway was released as a single, it reached number thirty-three in the US R&B Charts. Just subtle bongos and congas combine before The Salsoul Orchestra create an uber funky track. This means the rhythm section, blazing, horns and swirling strings join percussion, wah-wah guitars and keyboards. Horns growl, soaring above the arrangement as searing guitars and cascading strings demonstrate just why The Salsoul Orchestra were by 1977, disco’s premier orchestra. Candido released Dancin’ and Prancin’ in 1979. It featured Jingo, which dramatically opens. That’s an understatement. It’s not unlike Jimi Hendrix teasing you with a guitar solo before diving head first into a familiar track. Instead, it’s keyboards that take centre-stage. Then pounding drums and percussion drive the arrangement along. Combining elements of rock, jazz, Latin and dance music it’s a captivating track. Layers of music unfold, revealing subtleties and nuances aplenty. Urgent, punchy harmonies enter. They soar above the arrangement. By now, you’re swept along atop what’s akin to a musical roller coaster. Candido’s trusty percussion plus banks of synths and keyboards join a powerhouse of a rhythm section, on what is a truly captivating, compelling and genre-sprawling track. Gary Cris’ medley of The Girl From Ipanema and Brazilian Nights closes Diggin’ Salsoul Breaks. It featured on his 1978 album Rio De Janeiro, which failed to chart. Just a myriad of percussion creates a Latin backdrop before Gary’s sensually scats and the arrangement unfolds. Gradually, horns growl, while the rhythm section, percussion and keyboards provide the mainstay of the Latin arrangement. Gary lounge-style vocal is understated, but ensures the songs swings. He’s accompanied by gentle, cooing harmonies who prove a perfect foil for Gary. Then on Brazilian Nights, Gary’s vocal grows in power and passion. He’s accompanied by swathes of lush strings, subtle harmonies and percussion. Accompanied by John Davis and The Monster Orchestra drive each other to greater heights, fusing musical genres and creating a beautiful, dramatic and dance-floor friendly track. Diggin’ Salsoul Breaks is easily a mix CD that could be overlooked. The first three tracks DJ Muro chose aren’t exactly classics. They’re somewhat average and disappointing fare. Instant Funk’s The Funk Is On, Dr. Perri Johnson’s Psyched Up and Sound On Sound Productions The Incredible Hump may be blessed with killer breaks, but they’re far from the three best tracks Salsoul ever recorded. For a newcomer to Salsoul, they’d be wondering what the fuss was about. By then, many a listener will be looking for their receipt for Diggin’ Salsoul Breaks. After three tracks a refund seems appealing. Worry not, things do get better. Contributions from Gaz, Inner Life, The Salsoul Orchestra, First Choice, Double Exposure and Loleatta Holloway see an increase in quality. Mind you, many of these tracks aren’t exactly obvious choices. Examples of this are Loleatta’s All About The Paper and First Choice’s Love Thang. For DJ Muro, lest we forget, it’s all about the breaks. Sometimes his pursuit of the perfect break results in the quality of music suffering. This isn’t the case with Double Exposure’s Everyman and Loleatta Holloway’s All About The Paper. They prove to be a musical marriage made in heaven. Following it up with Skyy’s High and then Edwin Birdsong’s Win Tonight works really well. Other times the mix seems to lose momentum through the choice of track. Then just as you’re about to despair and wonder where your remote control has gone, things improve. From Chocolat’s El Caravanero right through Candido’s Jingo and Konga’s Konga’s Fun the mix is building to a crescendo. This is happening without a Salsoul classic in sight. Instead, the strong Latin influence propels the arrangement along. Things go slightly awry with Joe Bataan’s When We Get Married. It breaks the momentum built up by his Latin Strut. DJ Muro then makes up for this with Gary Cris’ medley of The Girl From Ipanema and Brazilian Nights, which sees Diggin’ Salsoul Breaks reach a dramatic crescendo. DJ Muro’s Diggin’ Salsoul Breaks has been a compelling music journey. It’s one that’s far from flawless, but one that’s been intriguing. Muro’s musical choice is guaranteed to provoke debate and dissent among discerning Salsoul fans. Whether you enjoy, approve or agree with the music on Diggin’ Salsoul Breaks is a matter of choice. For me, Diggin’ Salsoul Breaks started badly but got better. The first three tracks were the wrong tracks despite the quality of the breaks. At least DJ Muro rectified this and got Diggin’ Salsoul Breaks back on track. While Diggin’ Salsoul Breaks is far from the best Salsoul mix I’ve heard, it’s certainly not the worst. Mixed in his tradmark style, DJ Muro’s pursuit of the perfect break on Diggin’ Salsoul Breaks is an adventurous and eclectic selection of tracks. Standout Tracks: The Salsoul Orchestra Chicago Bus Stop (Ooh I Love It), Double Exposure Everyman, Loleatta Holloway All About The Paper and The Salsoul Orchestra Getaway. ← NANCY WILSON-THE SOUND OF NANCY WILSON AND NANCY.